If you're on my Facebook or Twitter page you probably saw that Natalie was taken to the ER because of a gash to her head. She's okay and I'll be sharing that story on Wednesday! “I cleaned my room!” Natalie said proudly. She took hold of my hand and pulled me down the hall. Then she pointed. 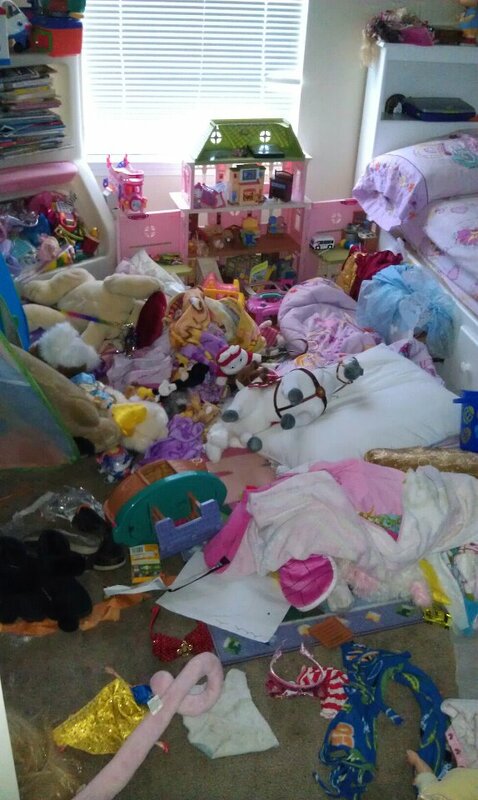 Maybe we had been watching too many episodes of Hoarders. Later on I told Natalie that she needed to clean her room. As in, REALLY clean the room. I knew her room would take longer than five minutes. In fact, I was hoping it would take longer than five minutes so I could read some of my book in peace. I was a tad disappointed that she was back so soon. Hehehe. My parents' biggest mistake was putting a huge window seat in my room. The under-seat storage area was great for helping me "clean" my room. Glad to hear she's okay (since I don't use Twitter, that's the first I've heard of it). Maybe hitting her head will magically knock some sense into her and teach her how to clean for real? Ha. I'm glad she is okay. LOL!! 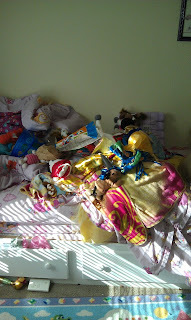 My oldest was like this until the day she moved out....and became an OCD neat freak like her Momma!! HAHAHAAAAAAA - your daughter's room looks a lot like my son's room. Hmmm, yes, I think her concept of "clean" is different than the mainstream one. Glad she's okay. The room could use some work though. . . I like her concept of clean too!! That kid cracks me up!! I always love when your kids are featured!! Well as long as everything in there is clean I'm not sure what all the fuss is about. Hehe!!! That is exactly what my 9 year old boys room looks like. I'm so glad we're not alone! Cleaning is just moving things to a different spot, right? She did great! Too damned cute, this is. Good try Nat! Good try!